As many wine lovers know, Cameron Hughes is both a man and a brand synonymous with deals in wine sold at a discount and cloaked in anonymity. Hughes buys wine from producers that can't (or don't want to) sell all the wine they produce (in high-yielding vintages or to keep supply low). He's also known for getting wine that doesn't quite make the cut for high-end releases which the producer wants to quietly remove from the books and away from their reputation. Non-disclosure agreements ensure producers' reputations aren't harmed by Hughes selling $100 wine for $20. Hughes labels the wines with a generic Lot number with little identifying info as to the wines' origins. He does offer hints (maybe a few embellishments) in his Cam's Confidential. Well, not too long ago Hughes announced his greatest score ever as a négociant; "a once-in-a-lifetime, never-to-be-seen-again opportunity to own a six-bottle, six-vintage vertical of Cabernet from one of the most iconoclastic cult producers in the history of Napa Valley." That does sound like quite the score. Super bloggers Steve Heimoff and W. Blake Gray both tasted (separately) the wines with Hughes and published their opinions here and here. Speculation also abounds on the Wineberserkers online forum (I have participated in the discussion) as to the true identity of the shrouded wine collection. Last week, Hughes sent me the six-bottle vertical to try for myself. I'm honored to be considered a peer to Messieurs Heimoff and Gray, though I do wish I could have tasted them with Mr. Hughes himself. I've been a bit busy with the arrival of baby number two last week, but curiosity got the better of me and I popped open the 2006 the other night. I hope to open the rest and conduct a proper vertical in the near future (Christmas dinner??). The first thing I noticed when opening the wine was the cork. 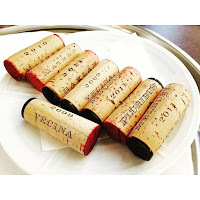 Now, I had already seen photos of the cork online, but it is interesting because it is obviously a high-quality cork with the vintage printed in a very distinctive font. But more interestingly, the bottom of the cork was barely stained; unusual for a nine-year-old wine. My best guess is that the bottles were recently recorked to remove the true identity of the wine. I also found the size and weight of the bottle curious. The glass isn't the exceptionally heavy and tall glass in which you find super-premium Napa Cabernet Sauvignons bottled. The shoulders are a bit broader than the run-of-the-mill Bordeaux glass, but the bottle was not any taller than the other regular lot Cameron Hughes wines I own. When poured, the Lot 2006 is a dark garnet color with slight bricking at the edges. The nose is actually kind of muted. I'm a big aroma guy, so I felt kind of let down. I smelled black tea and teriyaki sauce, but it was not the typical nose of a 15.7% alcohol-by-volume Napa Cabernet. Though the alcohol is not too noticeable on the nose, it is quite present on the palate. The finish actually burns a bit. If I had tasted this blind, I would guess it was something much older than a 2006 vintage. The fruit is faded, but tobacco, tea, leather, soy sauce, and molasses flavors are present. I put the half of the bottle that was still in the decanter in my chilly cellar overnight and there wasn't really much of a change in the wine the next night. It was a perfectly nice wine, but I don't know if this bottle is worth the ~$70 or so that Hughes is charging for it, let alone the $200-$300 he claims it is going for on the open market. Back to that distinctive font on the cork. If we dig a little deeper we get another clue that confirms the reason that font is familiar (at least to wine drinkers that are familiar with big-time Napa Cabernet producers). All wines have to get a Certificate Of Label Approval (shortened to COLA for those of us in the industry) from the U.S. Department of the Treasury's Alcohol and Tobacco Tax and Trade Bureau (better known as the TTB). Yes, wines that don't enter interstate commerce can apply for an exemption, but that's not the case with this set of wines. Wineries that bottle the finished wine are the responsible parties for getting this federal approval. Basically, the TTB wants to make sure all the required information is properly presented on the labels and there is no misleading, obscene, indecent or otherwise prohibited statements/graphics on the label. So this should be as easy as finding who put the wine in the bottle to ascertain the true identity. Right? Luckily for sleuthing wine drinkers like me, these COLAs are public information easily accessible in an online database. A quick search for recent Cameron Hughes wines turns up this COLA. Notice that the applicant is listed as Harlan Estate Winery. A quick Google search also shows that the font that the vintage on the cork is printed in is the same font Harlan uses for its wines. However, the corks for Harlan Estate are branded with the winery name and vintage. Nevertheless, this is a fascinating discovery. It is not every day you find Harlan Estate wine discounted like this. In fact, you'll never actually find that. Harlan Estate is one of the most iconoclastic cult producers in Napa, just as Mr. Hughes claimed. Harlan Estate sells for $850 per bottle. A second label produced from younger vines and wine not selected for the flagship wine called The Maiden sells for $150 per bottle. That's some pricey wine with a reputation for being top-notch, First Growth California Cabernet Sauvignon. Though the flagship price doesn't fit the description, The Maiden certainly could. Did proprietor Bill Harlan quietly sell his eponymous winery? No, of course he hasn't. He is actually actively expanding his wine empire. Ambitiously, Harlan has declared he has a 200-yr business plan that not only includes Harlan Estate, but his other brands: BOND Estates and the recently released Promontory. Why would he sell off one of those brands on which he has staked his family's reputation? The reputation of these three brands is second to none and Harlan selling bottles through Cameron Hughes at a dramatic discount doesn't quite add up. Plus, the description of the Private Reserve wine itself doesn't quite match with these brands. Hughes states the wine is sourced from vineyards in Rutherford, St Helena and Oakville. Harlan Estate is a single vineyard wine wholly within the Oakville AVA. The Maiden often contains wine not sourced from the Oakville estate, so it remains a possibility, but its cork is branded with more than just the vintage. And if in fact the Private Reserve wines were recorked recently, what appears on the cork should have little impact on what is actually in the bottle because all of the Harlan wines are branded. The BOND Estates brand produces a collection of single-vineyard wines throughout Napa Valley AVA (1 from Spring Mountain AVA, two from Oakville AVA, and 2 simply from the broader Napa Valley AVA) with long-term contracts on each vineyard source. BOND Estates also produces a second-label wine called The Matriarch that is a blend of the 5 Grand Cru wines that didn't make the cut for the single-vineyard bottlings. None of the BOND wines seem to fit the description Hughes provides. Promontory is a not-so-new project that seems new. In 2008, Bill Harlan bought several tracts of land in the foothills south of Harlan Estate. The vineyards here are not in any of Napa's nested appellations but in the general Napa Valley AVA. While Harlan builds a new winery facility dedicated to Promontory (Harlan Estate and BOND estates each have their own production facilities), the Promontory wines were produced at a winery near Harlan's Meadowood Resort. Harlan debuted Promontory with the 2009 vintage after making, but not releasing wine from 2008. In 2006 and 2007 the grapes went into Ladera's Lone Canyon Vineyard wine. So it seems Promontory is also a dead end. But wait, under the Harlan umbrella are two other wine brands. Harlan's son Will released his own wines under The Mascot label. The Napa Valley Reserve (TNVR) is another Harlan wine that is actually a private wine club with a six-figure membership fee that provides use of the facility and ability to buy Harlan-produced wine at a reasonable <$100 per bottle price. Wines are bottled under members' private labels, though TNVR is the actual licensee (permit number BW-CA-6978). All the other Harlan wine brands are produced under the Harlan Estate Winery license (permit number BW-CA-5475), but labeled as produced by the various brand names Harlan has registered (look for doing business as (DBA) on the COLA or CA winery license). An interesting tidbit about The Napa Valley Reserve: Illinois Governor Bruce Rauner caught a bit of heat because he was a member of this exclusive and pricey club. Another interesting thing about Rauner and Harlan is that Rauner is one of the investors and licensees of Promontory. But back to The Mascot and The Napa Valley Reserve; The Mascot potentially fits the bill as the source of the Cameron Hughes Private Reserve wines, but any TNVR wine is probably not the source because of the different license. If TNVR were to hold the COLA, Meadowood Associates would be listed as the applicant along with permit BW-CA-6978, not Harlan Estates and BW-CA-5475 as is the case with the Private Reserve. I decided to go straight to the producers of the wines to ask a few questions. My source at Harlan Estate, who requested anonymity, responded, "As you likely know, we have been buying fruit for R & D and selling wine with confidentiality agreements for 30 years. We have learned a lot over that time and continue to learn, with no plans to discontinue. It is important, however, that they are not to be confused with wines under our established labels." Hmmm... established labels versus other labels. This idea actually dawned on me quite early in my search. When I emailed Hughes, he of course said he could not comment on the Private Reserve wines because of his non-disclosure agreement. I did ask him about the 2012 Cameron Hughes Private Reserve that was not included in the vertical pack, but clearly has its own COLA. Hughes responded, "The 2012 is part of Private Reserve and the wine is from same producer, vineyards, etc. It has separate COLA because we bottled it. Not sure when we will release." So, let it be known there should be at least one other wine released in the future with the pedigree of this "once-in-a-lifetime, never-to-be-seen-again opportunity." Let's return to the idea of non-established brands produced by Harlan. The Mascot and The Napa Valley Reserve might fall in that category, but I doubt they are the source for the Private Reserve Collection. Plus, those brands have not been sold. In another turn of good luck, California winery licenses are public record and available on a searchable online database! Promontory did have a recent adjustment of its California license. You can see slight changes submitted July 31, 2015 between license 503803 and 558389. Looks like an investor was added and the address changed from that winery near Meadowood to the new facility near Harlan Estate and BOND. Neither of those seem to be earth-shattering revelations. Going back to the TTB database reveals quite a few brands produced by Harlan under the BW-CA-5475 license. Looking at the COLAs for most them reveals something I've noticed before. North Winery (used on label). That name, North Winery, is the same business name that appears on the Cameron Hughes Private Reserve Collection. Cellared and Bottled by North Winery, right there on the label! Could one of these "R & D" brands be the true identity of this mysterious collection? In an email to my Harlan Estate source, I stated that I doubted the origin of the Private Reserve Collection was actually any of Harlan's wine and mentioned the name of one of these Harlan-produced wineries that used North Winery on the label. The response was, "Your instincts about the wine’s origins are pretty good." Definitely not confirmation, but it still made my suspicion stronger. I also remembered seeing North Winery elsewhere during my research. If you remember those changes on the Promontory license, you may recall that the primary owner of the license was North Winery, but doing business as Promontory. We know that Promontory proper does not fit the description of the Private Reserve Collection. The years and the grape sources do not add up. And don't forget that Promontory (the brand, vineyards and new winery) still belong in the Harlan domain. Adding an investor to the license does not qualify for changing "hands between two individuals of considerable wealth." Maybe North Winery is a dead end. But wait! Remember, North Winery (doing business as Promontory) is no longer located at 500 Meadowood Lane in Saint Helena, but at 1595 Oakville Grade in Oakville. That address change is now looking intriguing. A search of CA winery licenses by address shows Harlan Estate canceling its license at 500 Meadowood Lane on August 20, 2015 (license 503810) and a new primary owner for 500 Meadowood Lane on August 21, 2015 (license 558055). I immediately recognized that name of the new owner because I saw the same name on a this Harlan COLA. Alejandro Bulgheroni Estate is my guess as to the identity of the Cameron Hughes Private Collection and it fits the description provided by Hughes. Nothing Hughes claimed about the wines is false and works with the Bulgheroni pedigree. It's undeniable that Harlan Estate was responsible for the production of both labels (one of the most iconoclastic cult producers in the history of Napa Valley - check) and that Michel Rolland's signature is on the label (Swiss-watch precision in partnership with the world’s foremost wine consultant - check). Looking at the Bulgheroni COLA, wine production appears to have started in 2006. Bulgheroni Estate hasn't applied for its own COLA yet because it hasn't bottled any wine. The inaugural release for the Alejandro Bulgheroni Estate appears to be 2014 (winery's library collection of shiners (bottled wines without labels) became available - check) because Bulgheroni is starting to make a splash in Auction Napa Valley and Premiere Napa Valley. These auctions could be where Hughes draws his auction price comparisons. Alejandro Bulgheroni Estate Napa Valley Cabernet Sauvignon has never been publicly released, that I know about. Yet, Wine Spectator published reviews of the 2009 and 2010 vintages of it on their online database - with a release price of $150. The price also fits in line with Hughes' price allusion. Perhaps the Bulgheroni team was not happy with the Wine Spectator reviews and decided to hold off on releasing its first vintage - following in the steps of Bill Harlan who waited multiple vintages before releasing his first wine publicly. And perhaps that's why Philippe Melka was brought on board to reunite with his mentor, Michel Rolland. And the one thing that crossed all of the usual Harlan suspects (those offered by the group of Wineberserkers and W. Blake Gray) off the list was that interesting mention of a winery in Napa Valley quietly changing hands between two individuals of considerable wealth, but the vineyards themselves not being part of the deal. Well, Alejandro Bulgheroni is the wealthiest man in Argentina and #283 on Forbes' list of wealthiest individuals in the entire world. He controls Argentina's largest private energy company. In recent years, he has acquired wineries in Argentina, Uruguay, Italy, and California. Bulgheroni and Harlan would certainly fit the bill as two individuals of considerable wealth. Some people might remember Bulgheroni's name from a few years ago when he acquired Renwood Winery in Amador County. It looks like he has had his eye on Napa Valley for almost a decade and finally put his roots down by purchasing Harlan's wine production facility near Meadowood Resort where Promontory was being produced - after Harlan produced wine for him since 2006. With a new production team in place and his own facility, Bulgheroni could part with the "R & D" wine produced and bottled by Harlan. Bulgheroni seems to have borrowed another piece from Harlan's playbook in the form of Gilles de Chambure, MS. De Chambure is now serving as President of Alejandro Bulgheroni Estate after working with Bill Harlan as Director of Education at Meadowood Resort and The Napa Valley Reserve for eight years (2006-2014). Bulgheroni's Blends Wine Estates also recently announced that his Uruguayan winery Bodegas Garzón will be contracting with Backen Gillam Kroeger, whose other projects include The Napa Valley Reserve, Harlan Estate, Ovid, Dana Estates, and Bond Estate Winery - yet another Harlan connection. And what about where the grapes came from for the wine in these bottles? Bulgheroni's website does not offer much information in the way of vineyard sources, however the Napa Valley Vintners' profile page for Bulgheroni lists Oakville, Rutherford and St. Helena as the appellations sourced by the estate - the exact same sources listed by Cameron Hughes in his video about the Private Reserve Collection. Am I saying this is fact? Of course not. I have not received confirmation from any party involved. However, Alejandro Bulgheroni Estate is the only producer that actually makes sense in every single way that Hughes describes the wine. Therefore, I am very confident in my guess as to what the true identity of the wine is, but I wouldn't bet my life on it. I really don't care that much, but I certainly had fun trying to figure this out. It's an impossible puzzle, and I love puzzles. I guess that's the Ron Swanson in me. Author's note: Cameron Hughes has public stated the wine is not from Alejandro Bulgheroni and that he had not hear of that producer until he read my assertion: "I don't normally participate in the speculation that goes on (it can get complicated and I'd rather not make a misstep) but in looking at their website, Bulgheroni seems a nascent enterprise so I would hate for this to somehow rub off on them. Its not their wine." Alejandro Bulgheroni Estate never responded to my inquiries. I've tasted three of them so far. Notes on the 2006 are above. When I get to the other three, I'll post notes on all six.